STUDENT NIGHT at The Who’s Tommy: In Concert! Don’t miss the music, the intensity, and the incredible story of The Who’s Tommy! On Saturday, February 15, Student tickets are available at the door for only $10. After the show, the cast of The Who’s Tommy is throwing a party in the CCPA lobby! 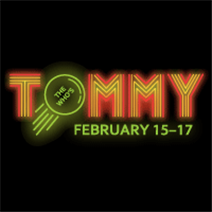 Meet the cast, enjoy food and beverage, and dance with music DJ’d by Tommy himself! The party goes for one hour after curtain and everyone is welcome.